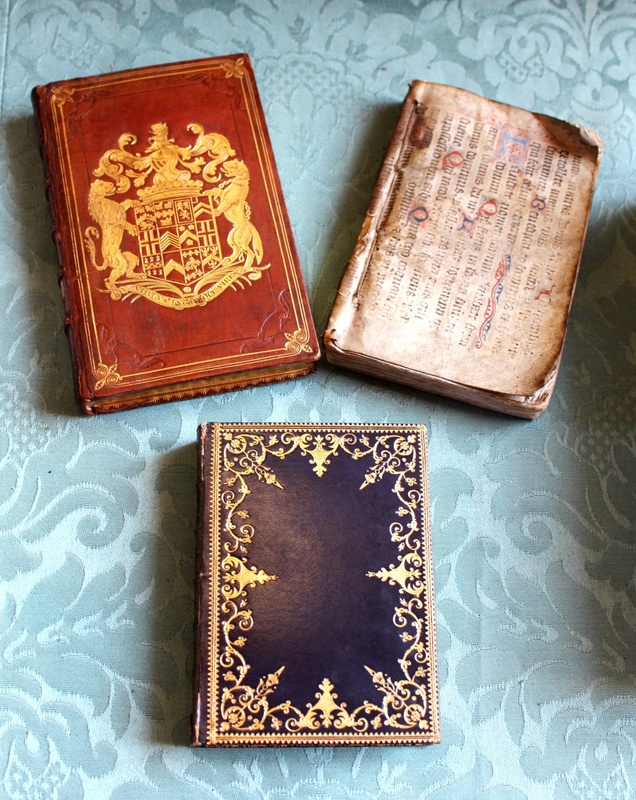 A couple of months ago we curated an exhibition featuring items highlighting various aspects of the history of King’s College Library over the centuries. Below you will find some of the exhibits. From the late sixteenth century until the current library opened in 1828, King’s Library occupied five of the side chapels on the south side of the famous Chapel. For most of this period it was a chained library. 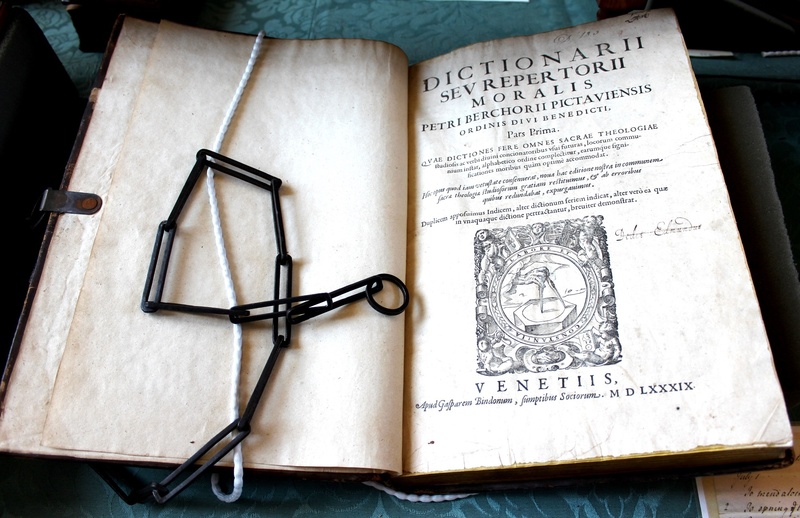 This book is one of a few to have survived with the original chains intact. Theatre was one of John Maynard Keynes’ particular areas of interest and his book collection includes many plays. He founded the Cambridge Arts Theatre in 1936. 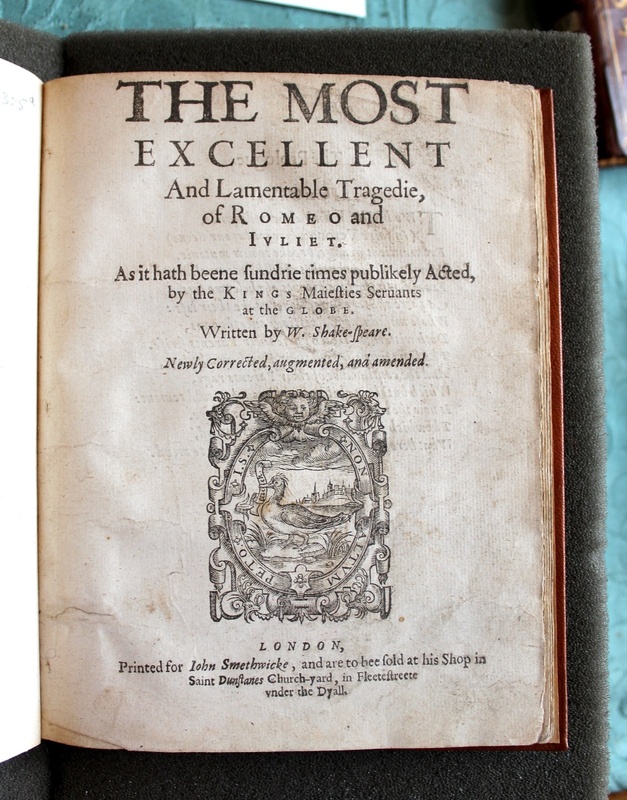 This is a reprint of the second quarto of Romeo and Juliet that was published in 1599. All modern editions are based on this version, which is considered to be the most complete and reliable text of the play. 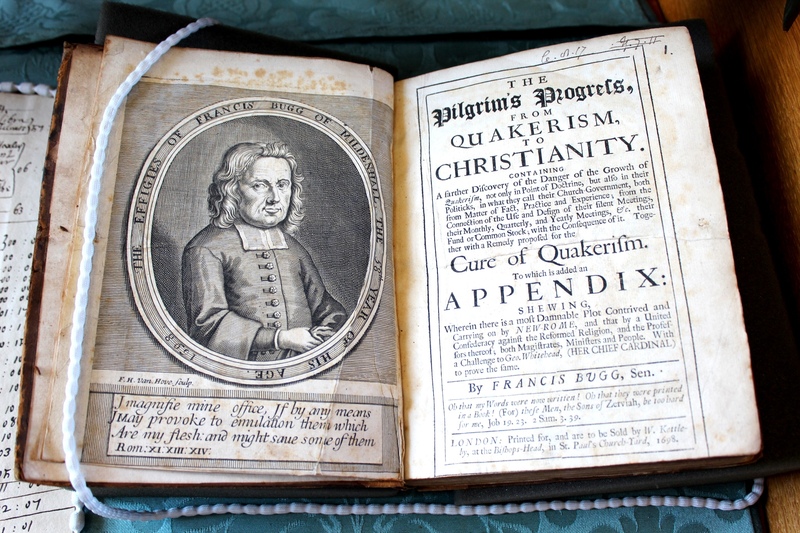 In 1638 Thomas Goad, a Kingsman and the son of Provost Roger Goad, who had been responsible for restoring the Library in the side chapels in King’s after a period of neglect, made provision in his will for the annual profit from some land he owned at Milton (near Cambridge) to be used in perpetuity to purchase divinity books for the Library. This was listed each year thereafter in the bursar’s account books as ‘Library Money’, and was spent on books and the upkeep of the bookcases and building. 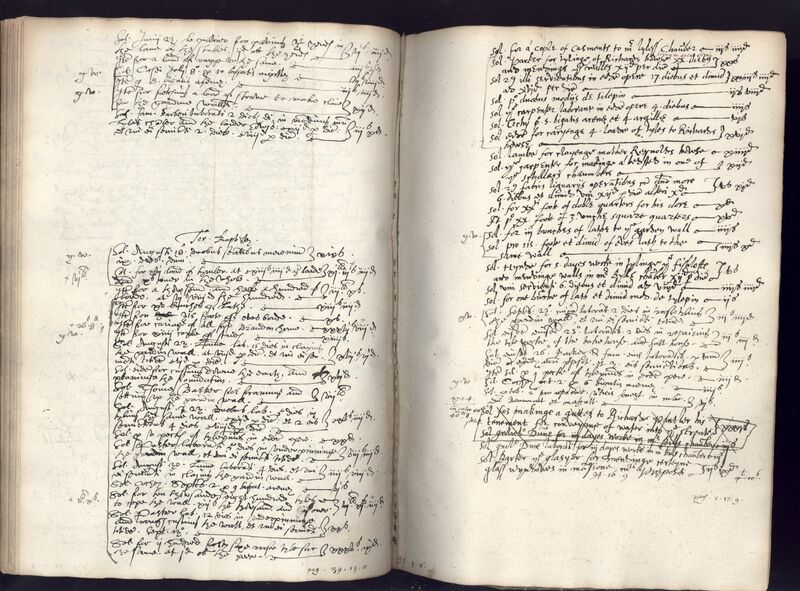 This is one of the books listed on the inventory of books bought in 1697–98: paid ‘to Mr. Bugg for his book’. In this case the book appears to have been bought directly from the author. 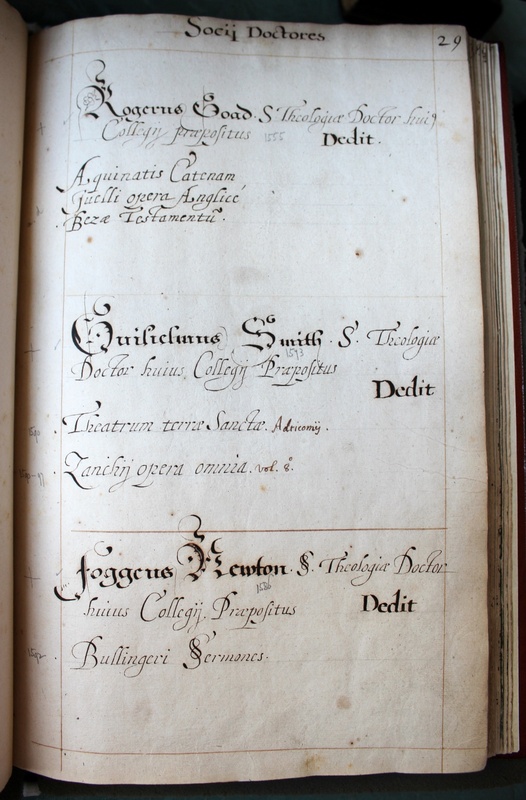 At the top of the page is listed the week (in this case, the third) of the financial year, then the name of the Fellow assigned to be Steward that week (in this case, Mag[iste]ro [John] Cowell). Then are listed the members of the ‘College society’ (the Provost is not included, his commons was usually accounted elsewhere): i.e. the Vice-Provost followed by the rest of the Fellows in their order of seniority, each of whom was allowed 20 pence weekly commons allowance in what amounted to an internal recharging system. An annotation next to someone’s name indicates if he was away from Co[llege] for the whole or just half the week. The Fellows are followed by the ‘Scholaribus’ = Scholars of the College, also in seniority order and allotted 20 pence per week, then ‘alii’ (others, also allotted 20 pence per week commons) which turns out to be the Bursar’s Clerk, the lay clerks and the chaplains. Then the Choristers are listed (10 pence each for their commons), then the ‘Servientes’ (servants, 12 pence per week each) that had been specified by Henry VI as being supported on the Foundation. Following the total commons allowance are, for each day of the week, the value of the food consumed at dinner and supper. You can see that an awful lot of beef (carne bovine) and mutton (carne ovine) was being consumed, plus milk, butter, eggs (ovis – we had no College chickens or cows), various types of fish (ling, plaice, roach, pickerel), pepper, sugar, currants, dates, cinnamon, cloves, mace, suet, rabbit (‘cuniculis’), tripe, neat’s foot (the heel of a cow or ox), ‘salsamente’ which is some unspecified sauce, oatmeal, mustard and possibly other herbs (‘sinapis’), and black or white salt (‘sale nigra’ or ‘albo’). ‘Cena’ means supper, apparently the last meal of the day. Sedge, wood and candles were part of commons expenses, I suspect the sedge was in the form of rushes strewn on the floor. Not much flour is accounted for but there was wheat (‘frumenti’) charged during this week – we had our own millstone. There are no expenses for honey that week. I have never seen expenses for beekeeping supplies in other years’ accounts books, so possibly honey was not used regularly in Hall. Following all of the expenditures is an account of what was still in the storerooms (in stauro), and internal accounting of various College members’ cizations, i.e. personal domus accounts. Dining expenses in the two weeks or so preceding the annual Audit at the end of October, were accounted separately. The year after the above, in the 18 days before October 30th, 1579, in addition to the usual mutton, beef etc., the College members were indulged with ‘a pigge’ one day (other pork cuts were served on other days), pigeons, capons, oysters, cream, marrowbone, veal (loin, breast, leg, shoulder and rack), ‘boylde chikins’, larks, a goose, mallard, teal and snipe. An entry for ‘sake’ doesn’t constitute previously unknown evidence of intimate links with Japan, it’s from the French ‘sec’ for dry wine. There was wine, white as well as claret, at almost every meal during the audit time. Sometimes the wine was used ‘for broth’. The College brewed its own beer at this time but beer is not mentioned in the Commons Books, suggesting that these accounts only list the actual expenditure on food. Fruit is often mentioned in general, with apples sometimes specified for the table, sometimes for tarts, and peaches are mentioned specifically once. 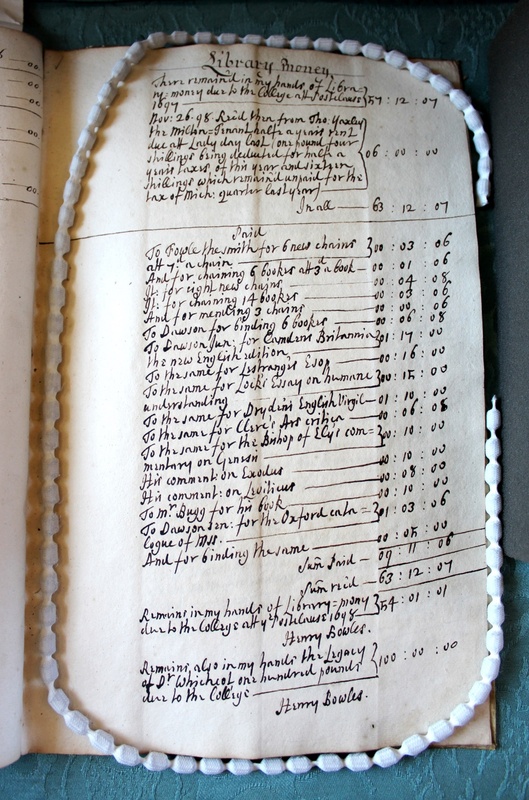 The ‘potticaries bill’ (halfway down in the image above) for the first week includes expenses for currants (5 pence per pound, that’s half a Chorister’s weekly commons allowance), prunes, sugar, cinnamon, ginger, cloves, mace, dates, pepper, capers, vinegar, verjuice, oatmeal, ‘unnions’, rose water and saffron. That’s a reminder of the days when medicines were plant-based and exotic plants were most readily available from the druggist. After someone asked me about a young King’s fellow in about 1579 (whom the enquirer thought might be the minister who married Will Shakespeare and Anne Hathaway – we were not surprised when I couldn’t find any supporting evidence at King’s), I searched through that entire year’s accounts. Some surprising, or at least interesting, things came up. The two great maps of the College site pre-Gibbs’ building are Hamond’s map of 1592 and Loggan’s map of 1688. 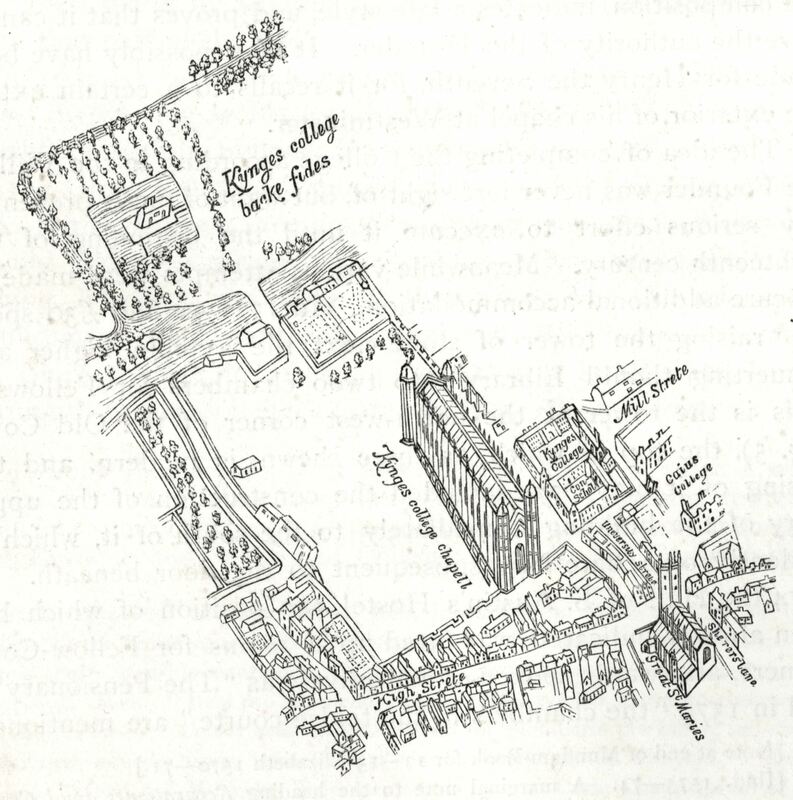 Hamond’s map is faint, and is reproduced here as a re-drawing from Willis and Clark’s Architectural History of the University of Cambridge and of the Colleges of Cambridge and Eton. The Loggan excerpt reproduced here is taken from a 1921 reprint by Clark and Gray. 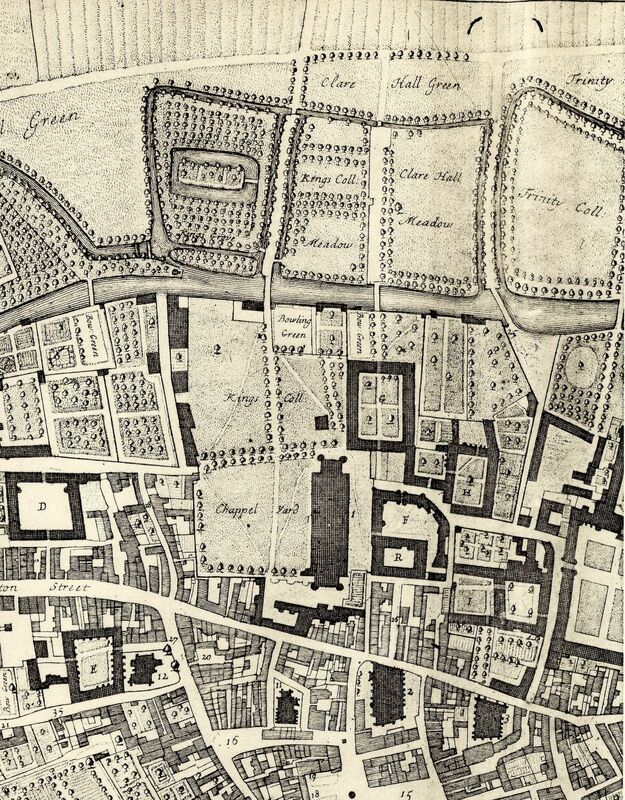 Queens’ Road (west) is at the top – the fields beyond, now the Fellows’ Garden, were common land at the time. What’s that moated site in the middle of Scholars’ Piece? On the Hamond map it’s occupied by a dovecote. And what about all those buildings around the wall surrounding the College site, particularly visible in Hamond’s map? What are they? The draft accounts (a page of which is shown below) offer some partial explanations. The abbreviation ob is for oblus, technically a halfpenny but the term often appears in the accounts to stand generally for ‘a portion’ – in this case the paving cost works out at 2 3/8 shillings per yard. This suggests it is internal to the College site, for the 1543 Cambridge paving bill (in force until 1788) decreed that all the public streets be maintained by the frontage-holders and that ‘no persone or persones exercysyng the handecrafte or ocupacion of pavyng wythin the sayd towne, shall take above a jd. q. for every yarde square pavyng’ (Cooper’s Annals of Cambridge, vol. 1, p. 411). Thus we paid someone to pave a lane, at two and a bit pence per yard, and he supplied the (rag-)stones at 4 shillings sixpence. We also paid Cochei for 10 cartloads of clay. It’s not clear whether this is a man called Cochei, or just ‘a coach driver’ – the designation appears in the accounts books frequently during these years, when labourers’ names are usually specified. From the marginal ‘g.w.’ next to this entry and others I surmise the clay (‘argille’), as well as the next items (sand and straw, also delivered by Cochei), were used to build the garden wall in that year. 10,800 tiles were purchased at one point to cope the garden wall ‘about the Fellows garden’ which had a locked gate. • sedge house with a wall around it which might be the same as the new straw house – a boat was required to remove the scaffolding after the sedge yard wall had been repaired, so if they are the same it must be one of the riverside buildings. The friars’ gate was approximately where Webb’s Court gate now is. There was a tennis court outside the friars’ gate and an orchard in what is now the Provost’s garden. There were lofts somewhere for malt and fish. Willis and Clark examined the accounts and offered some explanations, but it’s likely that in many cases we will never know which buildings were used for which purposes. So there are more questions than answers at this point, and plenty more research to do in those ‘boring, dry old accounts’. 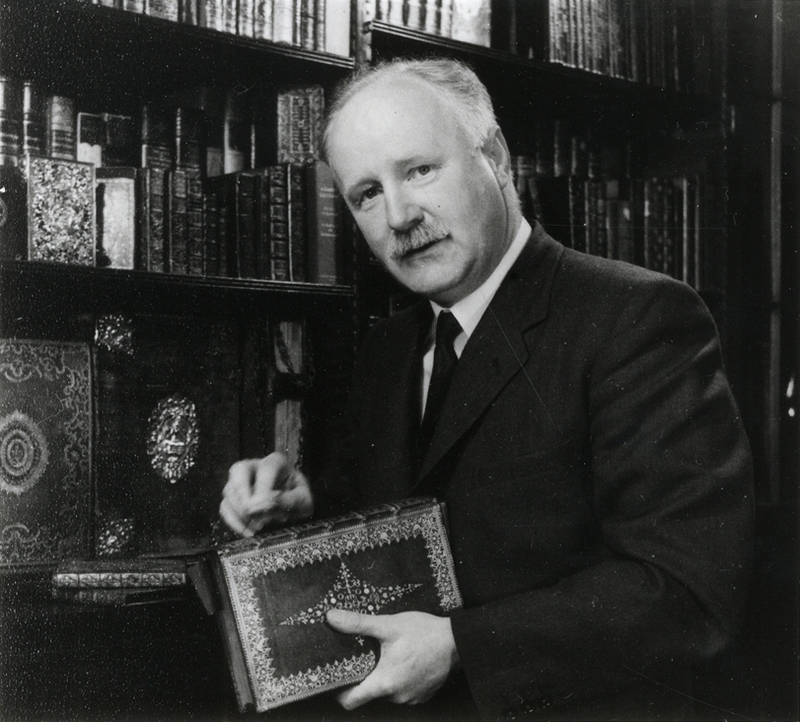 Building on the success of our 2013 conference to celebrate the centenary of ‘Tim’ Munby’s birth, ‘Floreat Bibliomania—Great Collectors and their Grand Designs’, we will be holding a second conference on 18-19 June 2016. This will be called ‘Mania and Imagination: Perils and pleasures of the private collector, present and future’, and will again be held in the Keynes Hall at King’s. Please visit this page for further details, including a programme and registration form. We hope it will be as enjoyable as the first conference, and that readers of the King’s Treasures blog will be well represented! 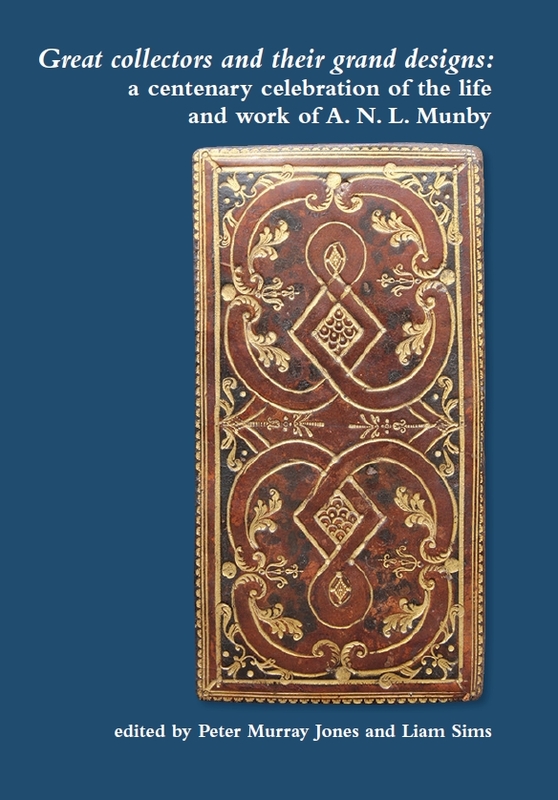 We are also happy to announce the publications of the proceedings of the first conference in a special issue of the Transactions of the Cambridge Bibliographical Society. See here for full details.